After an emotionally charged matchup against the Islanders last night, the Rangers (17-7-3) dropped their fifth game in their last six contests, falling 2-1 to the Colorado Avalanche (11-14-1) at Madison Square Garden. Credit where credit is due, and Colorado came into the Garden and played a very organized, structured game that made it difficult for the Rangers to get anything going. But they only managed 18 shots on goal and still came away with the win. Before the game started, the Rangers put on a fantastic display for their Garden of Dreams kids.Jordan Matalon, a cancer survivor, dropped the ceremonial first puck and Timolyn Benton sang the national anthem, a performance dedicated to three family members that passed away this year in service to the country. After signing a one day contract, seven year old Kayleigh Peterson led the team on the ice for warmups and watched from the bench. It was really a great thing the Rangers did for a wonderful cause. You could tell that the Rangers had played the night before, because it really showed in their game. They were sluggish to start and barely had any sustained possession. The good news is that the Avalanche looked like they hadn’t played in a week. They were sluggish too, and only had one good chance. The Avalanche had some possession in the first half of the period, holding the Rangers without a shot on goal for the first 11:27 of the game. Oscar Lindberg and Mats Zuccarello had the two best chances, with Lindberg just missing on a one-timer from the right faceoff circle while Zuccs forced Varlamov to make a save from the same spot. The two teams headed to the locker room with the Rangers holding a slight advantage in shots, 4-3. The second period, for most of the 20 minutes, was largely the same. The Rangers couldn’t get anything going, with just eight shots on goal through 30 minutes, and they wound up trailing in this period. In the first half of the period, Keith Yandle had the best chance, with two wrist shots from in-tight that were turned aside by Varlamov. Chris Wagner opened the scoring in the game, scoring his third goal of the season. Tyson Barrie sent the puck out from their own zone, and Jack Skille tipped it along for Wagner, who burst through the neutral zone with speed. He sent a wrist shot short side and beat Antti Raanta. Just over four minutes later, Matt Duchene continued his hot streak, scoring his team leading 14th goal of the season after sending a wrist shot past Raanta after Kevin Hayes turned the puck over at the blue line. The goal was assisted by Gabriel Landeskog and Carl Soderberg. It was his 13th goal in the past 15 games. 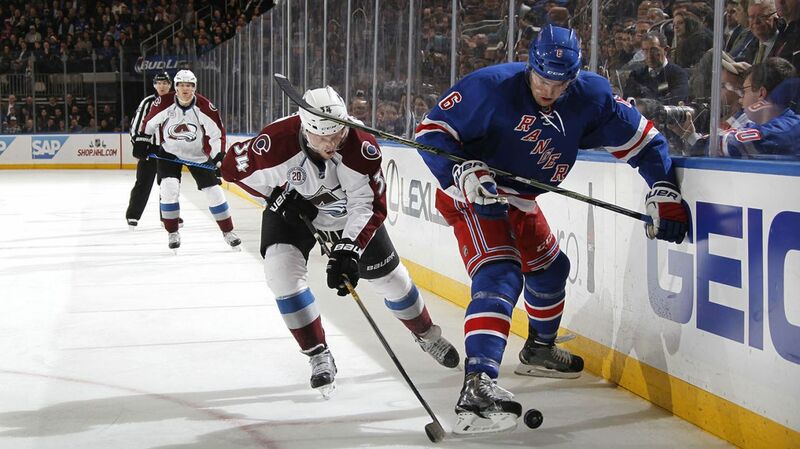 The Rangers had a late power play chance after Tyson Barrie was sent off for hooking with 1:04 left in the period. Varlamov made a blocker save on Kevin Hayes and turned aside Lindberg’s chance off the rebound, and Colorado headed to the locker room with a two goal advantage. The Rangers led in shots, 17-12, but it really didn’t feel like 13 shots in the second period for New York. None were very good. The Rangers really didn’t do anything relevant in the third period, not getting many shots on goal and missing the net wide over and over again. The Avalanche went into a defensive shell, sending only six shots on goal and finishing with 18 in the game. Alain Vigneault pulled Antti Raanta with 2:03 remaining, and the Rangers would finally break through with just 50 seconds left to play. Oscar Lindberg was positioned well in front of the net and put home a rebound from Derick Brassard. His 10th goal of the season ties him with Dylan Larkin of Detroit for most among NHL rookies. However, the goal was too little, too late. The Rangers took 59 minutes to wake up, and they didn’t have enough time to score the equalizer, and the Rangers have now lost five of their last six games. Antti Raanta was betrayed by his team yet again. He only faced 18 shots and was sharp for the most part, but his team didn’t show up. One of the goals was due to a turnover, and both of them were on breakaways/odd man rushes. Nothing you can do there. Oscar Lindberg has been very steady, and he’s starting to become a valuable net-front asset. He scored what’s becoming a trademark Oscar Lindberg goal, cashing in on a rebound, scoring the dirty goals in the crease and just being a nuisance to the goalie. He’s been excellent and deserves more ice time. Keith Yandle did all he could do. He had five shots on goal and tried to create some chances, but was surrounded by a tired and flat group of players. Also, Alain Vigneault refuses to play him on the power play where he works best. So there’s that. Also, why does AV consistently use Dominic Moore and Jarret Stoll, plus whoever is on that wing, for 15 or 16 minutes a night? For a game where the Avalanche had just 18 shots on goal, the fourth line was dominated and were on the ice for one scoring chance. Meanwhile, JT Miller and Oscar Lindberg played for 12 minutes. It doesn’t make much sense. Chris Kreider looks totally and utterly lost. He’s not physical, he’s not creating scoring chances, and he’s dragging down the play of Kevin Hayes and Jesper Fast on his line. There’s something wrong with his mentality, it’s not an effort thing, but he is overthinking the game. And there have been far too many lackluster performances. This game was an embarrassment. The Rangers did next to nothing on offense and played a really flat game. Sure, you can blame some of it on the fact that they’ve played an absurd five games in seven nights, but it’s also this thing called REGRESSION. An absurdly high PDO generally isn’t sustainable, and now the team is 1-4-1 in the last six games, and they’ve scored just 10 goals in that span (1.67 GPG). For a team that scored an average of over three per game, that’s bad. And with players underperforming, it makes things more difficult now. But Steve Valiquette said it best. Good teams lose. The Kings lost nine of 10 in 2014, and went on to win the cup. The Blackhawks had numerous losing streaks last year, and went on to win the cup. This stretch doesn’t mean that the season is over. The Rangers can be much better than this, it just takes some time to work out. The Rangers will head out on a three game road trip to Western Canada, starting with the Ottawa Senators on Sunday. Posted on December 4, 2015, in Game Recaps and tagged Alain Vigneault, Antti Raanta, Chris Kreider, Colorado Avalanche, Dan Boyle, Dan Girardi, Derick Brassard, Derick Stepan, Dominic Moore, Dylan McIlrath, Emerson Etem, Henrik Lundqvist, Jarret Stoll, Jesper Fast, JT Miller, Keith Yandle, Kevin Hayes, Kevin Klein, Madison Square Garden, Marc Staal, Mats Zuccarello, Matt Duchene, MSG, Nathan MacKinnon, New York Rangers, New York Rangers blog, NHL three stars, NYR, Oscar Lindberg, Rangers, Rangers blog, Rick Nash, Ryan McDonagh, Stepan injury, Viktor Stalberg. Bookmark the permalink. Leave a comment.